Depending upon the cause of the initial hard drive failure, the engineers will repair the electronics or hardware. One of the most common hard drive recovery scenarios involves a clicking hard drive you can hear an example here. The clicking is most likely a head failure. The repair of the heads usually entails replacing them from a good hard drive of the same exact model. 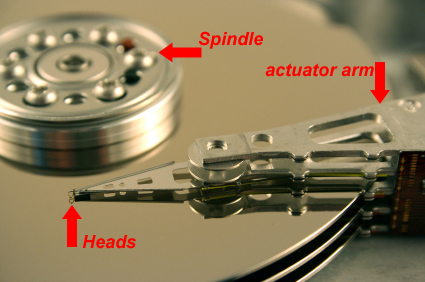 Once the heads have been replaced, the engineers move on to reading the disks and moving the data off to stable media. These are just a couple of techniques the engineers at DTI Data use when doing hard drive recovery. Feel free to call us Call Toll Free: 1-866-438-6932 or fill out an online quote form for immediate support. Illustations of drives in prestine shape are very nice to see. Unfortunately, here at dtidata we see drives that look abit worse for the ware. Many of the drives we see have pit marks or light scoring where the heads have actually touched the platters of the hard drive. Hard drive recovery has become exponentially more complex due to many factors. Obviously, hard drives are much larger and have an incredibly high ariel density. In addition, do it yourself attempts of data recovery with software on physically failing hard drives will cause damage to the media (platters) which hold the magnetically charge data. Many of the recovery techniques we use include proprietary techniques to recover data from hard drives that have suffered damage to the media (platters) of the hard drive. However, continued attempts to power up a physically damaged hard drive can cause complete unrecoverable data loss. Here at dtidata we manufacturer data recovery software. Data recovery software should only be used for logical file system failures. File system failures include deleted files, Format of a hard drive, accidental Fdisk or lost partition, lost boot sector or virus attack. A clicking hard drive is a symptom of a head crash. If you here any unusual noises coming from your hard drive power down immediately. given you expertise, I am wondering what brand of hard drives do you find to be most reliable? They all break, they all crash, and they all fail. We see an equal amount of WD’s as we do Maxtor or Seagate. With external hard drives the fan cooled Seagates are the best. Fujitsu make real good laptop drives as do Samsung. Samsung also makes a high quality high density desktop drive. Seagate and Maxtor are the same now so they are on par with Western Digital, which are among the best for reliability, but our WD MyBook page on this blog has tons of horror stories about it so I guess you are rolling the dice no matter what drive you choose. The key is to back up and back up often!